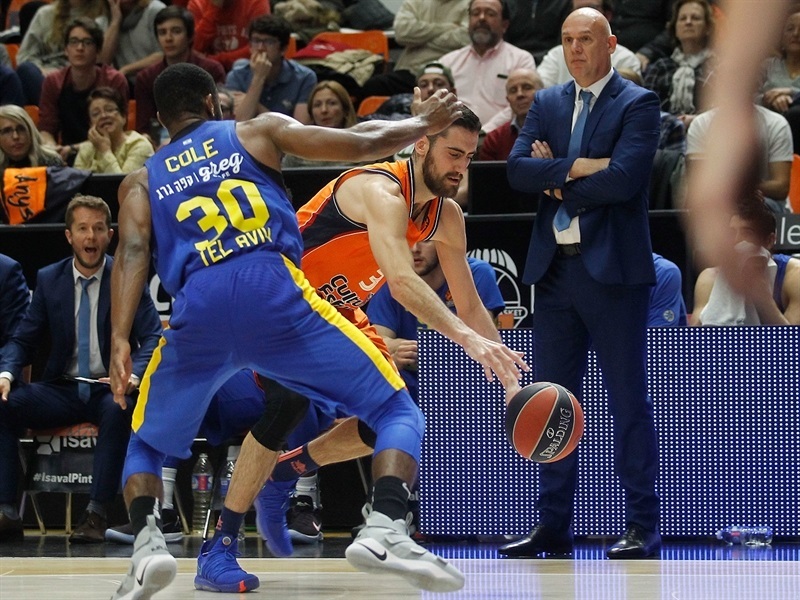 Valencia Basket gave its home fans a final thrill of the Turkish Airlines EuroLeague season by outlasting Maccabi FOX Tel Aviv for a 87-84 victory on Friday. The win let Valencia finish 12-18 and move up from 14th to 11th place in the final standings. 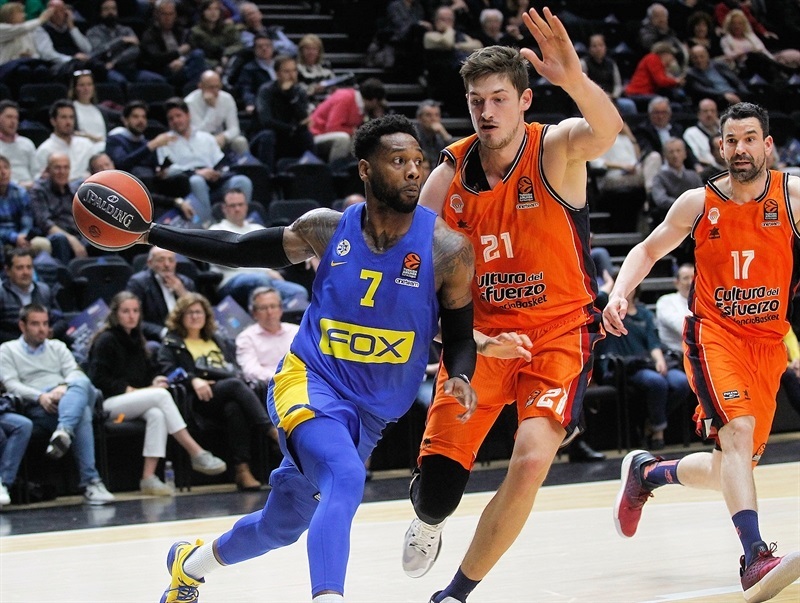 Maccabi, which played without guards Pierre Jackson and John DiBartolomeo, fell to 13-17 and 10th place. 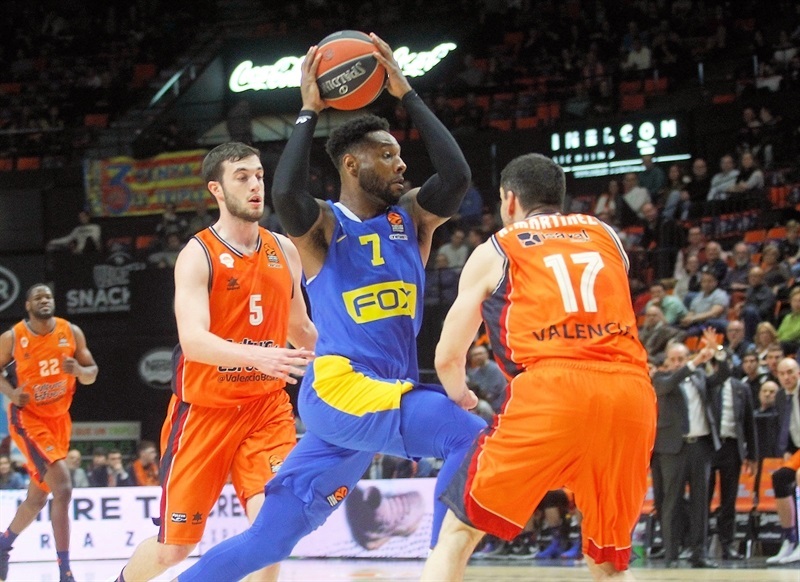 Maccabi reeled back an 18-point second-half deficit to get within 65-64 early in the fourth quarter and 85-84 with a few seconds left, but Valencia's superior outside shooting was the difference in the end. The hosts hit 11 of 28 three-pointers on the night, while Maccabi downed just 3 of 17. 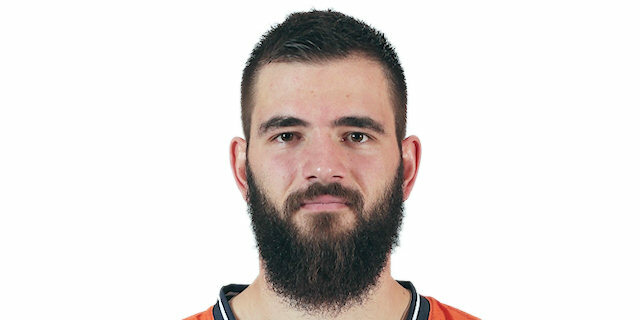 Bojan Dubljevic led Valencia with 15 points and Erick Green had 12. The trio of Alberto Abalde, Sergi Garcia and Sam Van Rossom, who hit the final insurance free throws, scored 11 each. 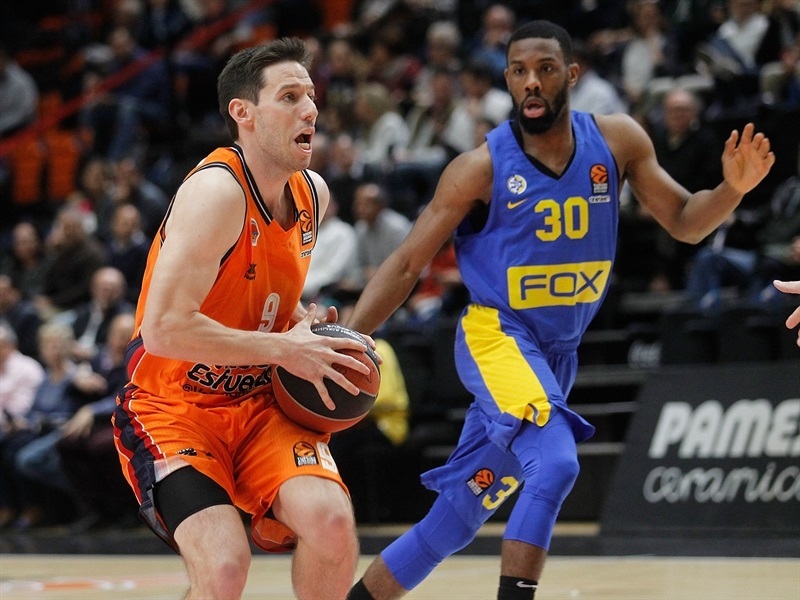 Norris Cole played more than 38 minutes and scored 22 points for Maccabi, while Jonah Bolden added 12 and Michael Roll 10. 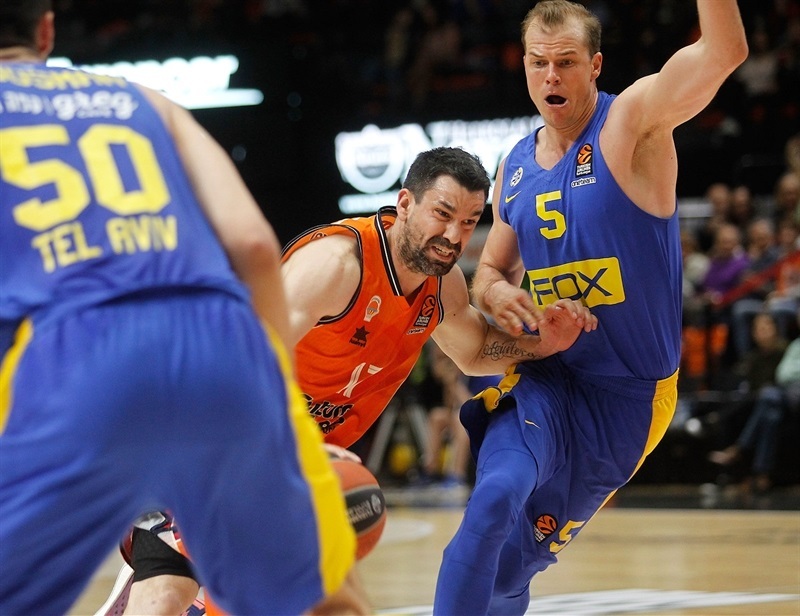 Dubljevic's 5 points in a row didn't prevent Maccabi from leading 5-6 on a basket by Norris. Dubljevic got help from Will Thomas and Rafa Martinez, but Artsiom Parakhouski and Cole kept the visitors close at 10-11. 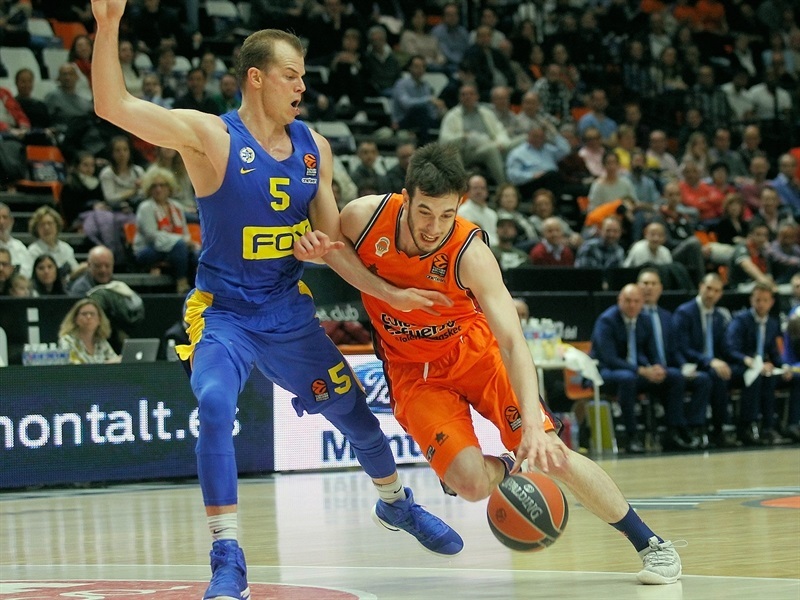 Tibor Pleiss scored Valencia's next 5 points and Van Rossom made it 19-14 from downtown. 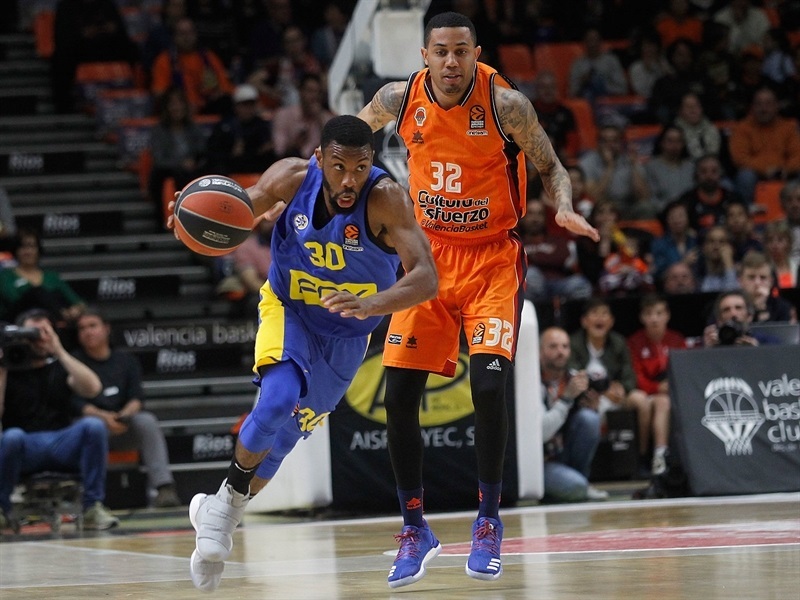 Bolden, Alex Tyus and Deshaun Thomas scored inside, but Pleiss converted a three-point play for a 24-18 Valencia advantage after 10 minutes. Abalde appeared with a sweet scoop shot to open the second quarter. Green scored 5 in a row before Garcia took his turn with the same amount. When Green stole and raced for a reverse layup it was suddenly 38-24. As Maccabi's outside shooters couldn't hit, Garcia soon went deep again to make it 46-28. Tyus hit a tough basket, but left with an ankle injury, before Yovel Zoosman's three-point play cut the difference to 46-34. DeAndre Kane's coast-to-coast layup kept it going before Abalde struck from deep, ending Maccabi's 0-8 run, but free throws by Roll and Bolden let the visitors cut the difference to 52-39 at the break. Van Rossom dialed up a deep three and Dubljevic hit free throws as the Valencia lead climbed to 57-38 after halftime. Itay Segev's three-point play re-started Maccabi's offense. Parakhouski scored in close and Bolden dropped his team's first three-pointer after 10 misses to make it 57-49. Bolden followed his finger-roll layup with a steal and dunk before Kane downed free throws at 57-55, completing a 16-0 run. Abalde's layup and free throws ended Valencia's scoring drought of 7 minutes, but Thomas slammed to end the third quarter 61-57 to make it a whole new game. 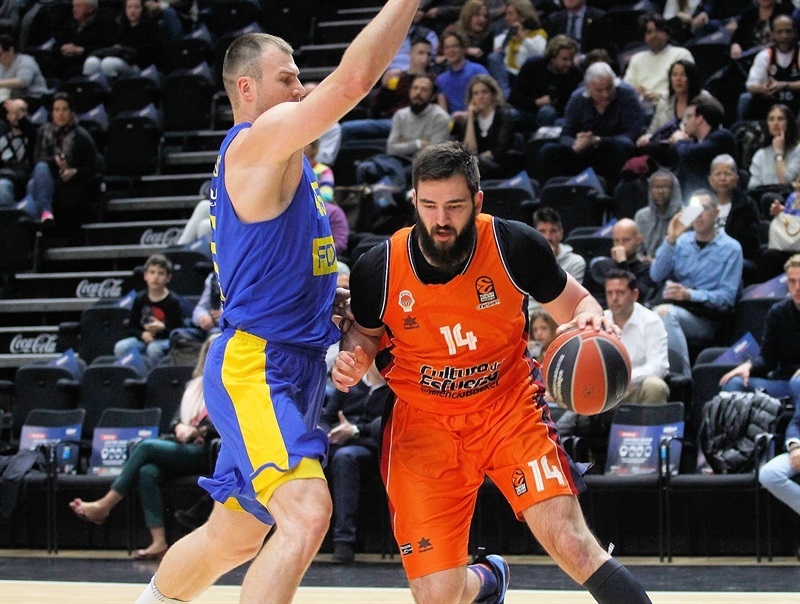 Cole's 5 points and assist to Thomas early in the fourth quarter got Maccabi to within 65-64. 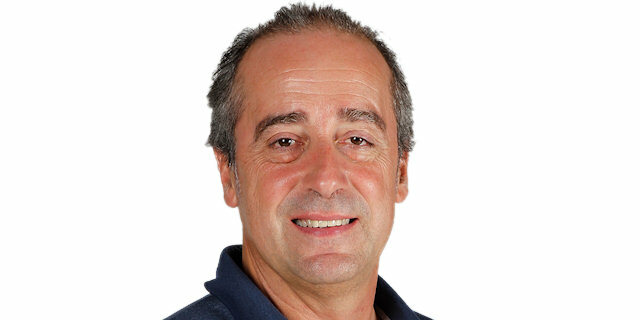 Martinez answered from deep and soon Garcia joined him to restore a more comfortable 73-66 Valencia advantage. 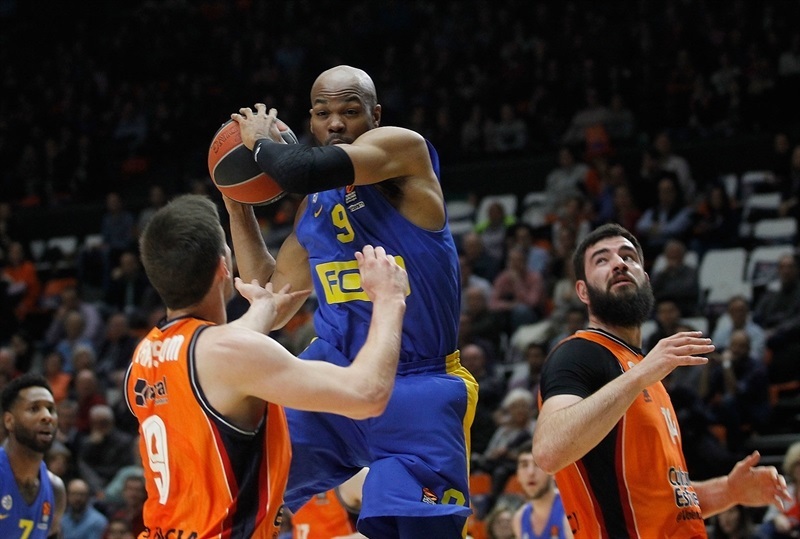 Cole drove for 3 layups to keep Maccabi within 77-72, but Dubljevic's third in a row, as well, kept the hosts safe. Kane's triple dropped the difference but Thomas answered in kind, Cole hit his first from downtown to make it 82-78 with 90 seconds left. Van Rossom was left open to hit again from the arc at 85-78. It seemed all Valencia's then but Kane's steal and layup and free throws by Roll made it 85-84 with 5 seconds left. Van Rossom got to the foul line and hit both shots to send the fans home happy. 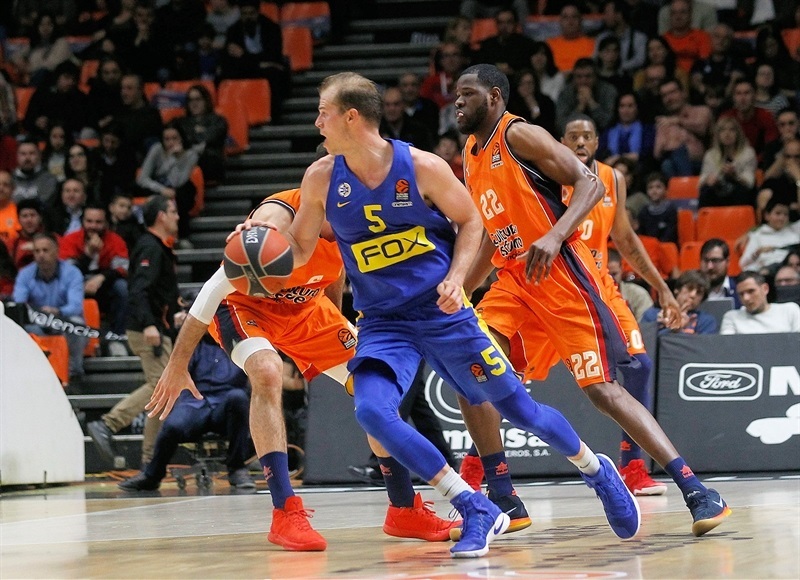 "Our job during these 40 minutes was to take this important win for us, to finish the second half of the regular season with a positive balance, and to continue this series of beating some great EuroLeague teams here in the last few months: Panathinaikos, Khimki, Barcelona, CSKA and now Maccabi. For us, it was the only chance we had to accomplish something in the second half of the season, and we took it, we did our best. It was a well-done season, especially with the problems we had. I am satisfied with my players and I think that with a little bit of luck we could have been fighting to be in the playoffs." "Big game for us. We saw a game with a lot of tribulation, but for us what's most important is the victory for our confidence in the Spanish League. 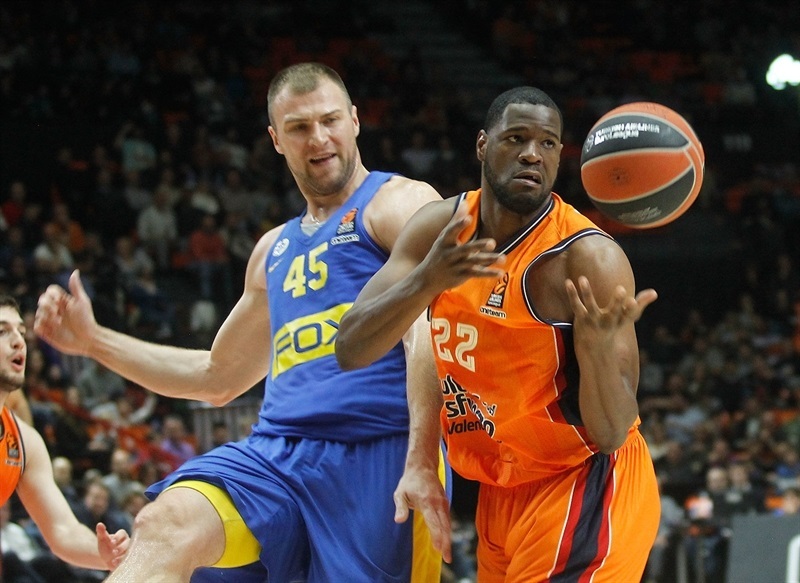 We're going to do everything now to come back to the EuroLeague next year."